When a set comes out, it’s easy to say that everything is going to go down in price. And it will. 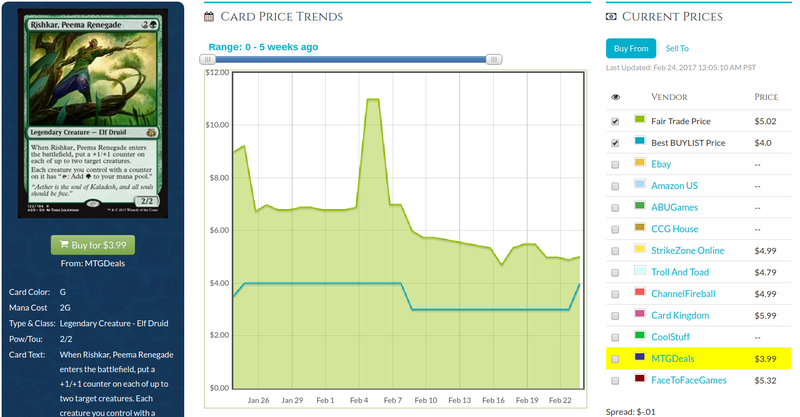 I aggressively trade/sell/rid myself of cards early in a set’s life. Today I want to look at Aether Revolt cards, but instead of trying to pick the lowest, or the highest, I want to focus in the middle and see which of these cards are going to go up or down in value. I’m picking Aether Revolt today, because the supply is much smaller on this set than Kaladesh, and we are all about to go crazy with Modern Masters 2017 spoilers. 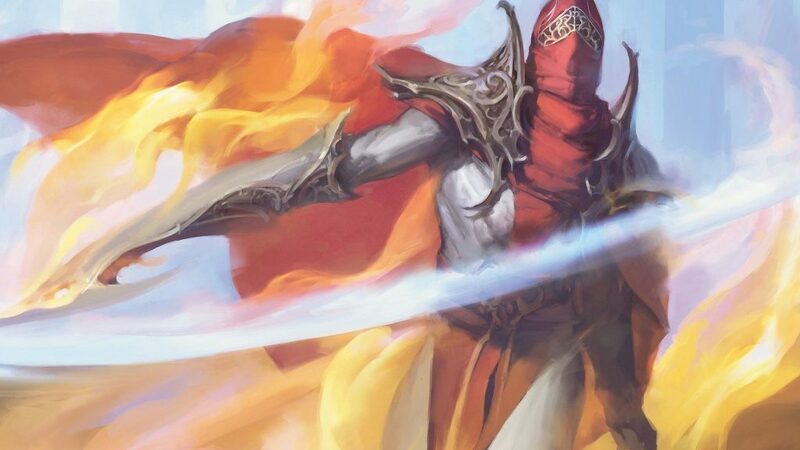 Tezzeret the Schemer – $8.50 – He hasn’t fallen far enough to be an auto-pickup, but the deck that wants him is so very narrow. Also, he’s going to be 2UB to kill two creatures over two turns if you have enough artifacts (not a given). The plus ability and the ultimate seem underpowered to me, so I think he’s going to keep trending downward. 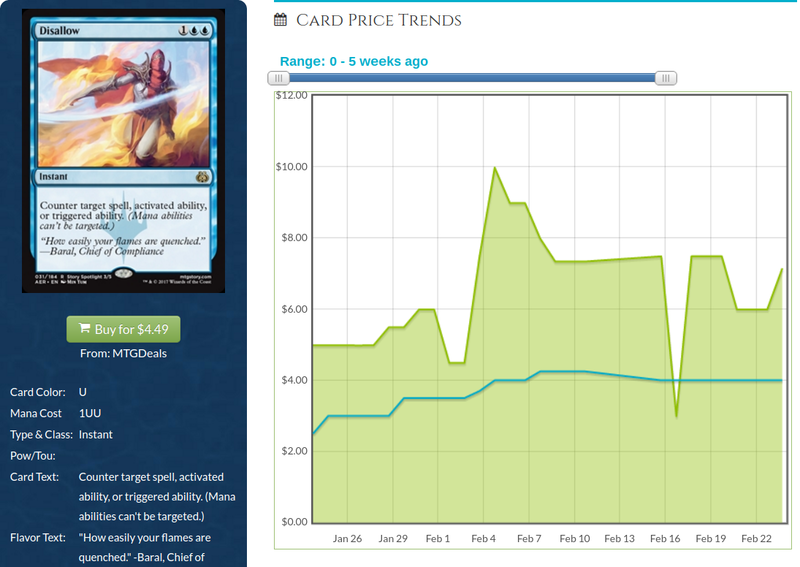 Ajani Unyielding – $6.50 – This is going to be his price for the length of his stay in Standard, I think. I like how clearly defined each of his modes are, but six mana means he’s never going to be a four-of as newest Tezzeret might be. Just leave him alone for now. 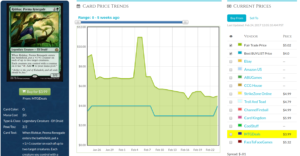 Disallow – $7.50 – What an interesting graph. 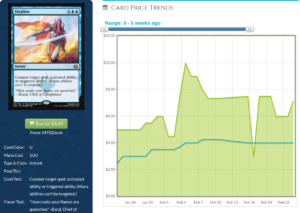 This has gone up since release, and the reason is primarily the assorted Saheeli decks playing 2-4 copies of the card. Playing this card in one of the rock-paper-scissors of this format means that it’s going to be pretty stable. The problem is that this deck is built around a two-card combo, and I’m not sure that the combo is going to survive until it rotates in the fall of 2018. This card is an excellent control card, versatile enough to answer something that I thought was going to dominate Standard: an ultimate from Liliana, the Last Hope. It seems so easy to play her before counters are ready and protect her for a few turns, then let the Zombies take over. Disallow lets you not worry about that ultimate, or other problematic things. I think this price should go down, considering it’s only a rare, but there are a lot of factors at play and I’m not going to get any of these right now. If control gets some new toys, then this is going to benefit mightily, but that seems unlikely at this time. Fatal Push – $5.51 – Here’s my hot take: This is going to go up. I think the foils are a steady bet to stay around $30 for some time, but the nonfoils are seeing a tremendous amount of play in a range of formats, and this promises to be heavily played for the next 18 months. You can get them on eBay for a touch under $4 if you get it by the playset, and I am expecting this to creep upward now that are in the final weeks of opening the set. I’m picking these up as I can, and I’m expecting to out them in nine months or so. Rishkar, Peema Renegade – $5.37 – I also like this to go up, as value, as an enabler, and as a casually fantastic card. Please pay attention to how small the spread has gotten, because either the buylist needs to go down or the retail needs to go upward. I love accelerating into a six-drop on turn four, and the fact that Standard doesn’t have a premier six means Verdurous Gearhulk gets to come down the following turn and you’ll be able to attack with one of those creatures. This is a card that’s also gained value due to the change to Planeswalker decks over Intro Packs, as this whole cycle of legends would have been contenders to be the foil. As it stands, this is an excellent contender to be $8 or so by Christmas, and $10 in 12 months is possible. Glint-Sleeve Siphoner – $2.48 – This is not Dark Confidant, it’s both better and worse. If you have alternate ways to make energy, this is a fantastic way to spend that energy. I’ve been really surprised at the decks which have so much energy laying around and nothing to do with it, but this is clearly designed to be an aggro card. If there was another energy set available, I would be all over it, but I need this to be closer to a dollar before I’m comfortable moving in.